Men of the 64th Bomb Squadron, 43rd Bomb Group prepare for a mission against the Japanese on November 17, 1942. The photo was taken at Mareeba, Australia. L-R: Captain David Hassemer, 2nd Lt. Jacob Franz, Lt. John Crockett, Lt, Raymond Holsey, Captain Eugene Halliwill, Lt. Jack Ryan and Sgt. John Rosenberger. Though the B-17’s role in Europe has been studied for decades, the Flying Fort started its USAAF combat career in the Pacific. The 19th Bomb Group, stationed in the Philippines in 1941, carried out the first American B-17 raids of WWII. Later, the 19th moved to Australia, supporting the Dutch East Indies campaign along with the 7th Bomb Group before joining the fight over New Guinea and Rabaul. The 7th later went on to serve in the China-Burma-India Theater. A B-17 in Northern Australia, May 1942.As the 19th held the line, the first squadrons of the 43rd Bomb Group began to arrive in Australia. By late summer, as General George Kenney took command of the 5th Air Force, the entire 43rd had reached the SWPA, giving him two groups of heavy bombers with which to strike the Japanese. Being an unconventional thinker, Kenney and one of his aides, Major Bill Benn, talked through how to better employ their Forts. Pre-war doctrine called for mass formations of B-17’s to hit both land and naval targets, but Kenney knew he’d never get very many heavies. Bombing ships from 20,000 feet with a half dozen or less B-17’s on any given mission had resulted in almost no hits. Had a hundred or two hundred Boeings been used to saturate an enemy naval force with bombs, perhaps they would have had more success. As it was, Kenney had to make do with somewhere between twenty and forty B-17’s available for operations on any given day. With a percentage always performing long range reconnaissance missions, the 5th Air Force rarely had more than a dozen B-17’s free for bombing missions. 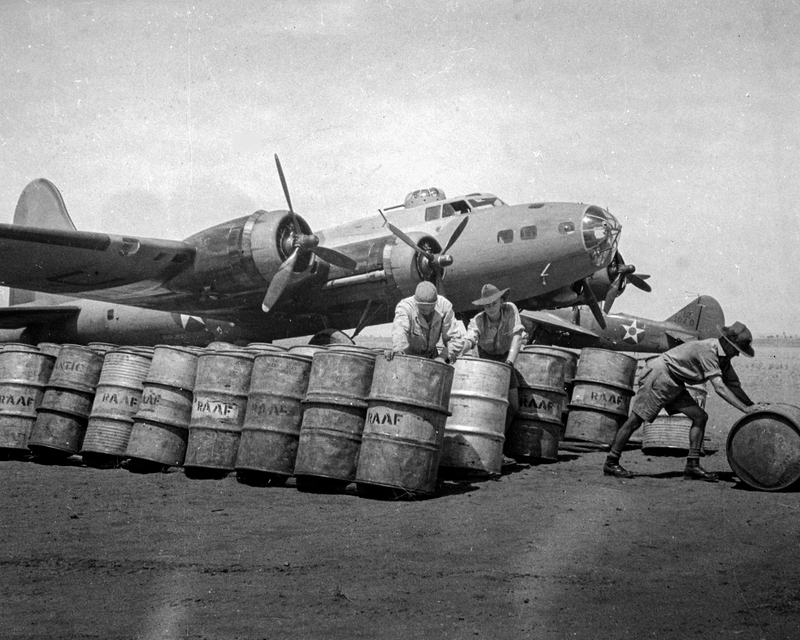 Bombing up a Fort at Mareeba, November 17, 1942. As the 19th held the line, the first squadrons of the 43rd Bomb Group began to arrive in Australia. By late summer, when General George Kenney took command of the 5th Air Force, the entire 43rd had reached the SWPA, giving him two groups of heavy bombers with which to strike the Japanese. Being an unconventional thinker, Kenney and one of his aides, Major Bill Benn, talked through how to better employ their Forts. Pre-war doctrine called for mass formations of B-17’s to hit both land and naval targets, but Kenney knew he’d never get very many heavies. Bombing ships from 20,000 feet with a half dozen or less B-17’s on any given mission had resulted in almost no hits. Had a hundred or two hundred Boeings been used to saturate an enemy naval force with bombs, perhaps they would have had more success. As it was, Kenney had to make do with somewhere between twenty and forty B-17’s available for operations on any given day. With a percentage always performing long range reconnaissance missions, the 5th Air Force rarely had more than a dozen B-17’s free for bombing missions. 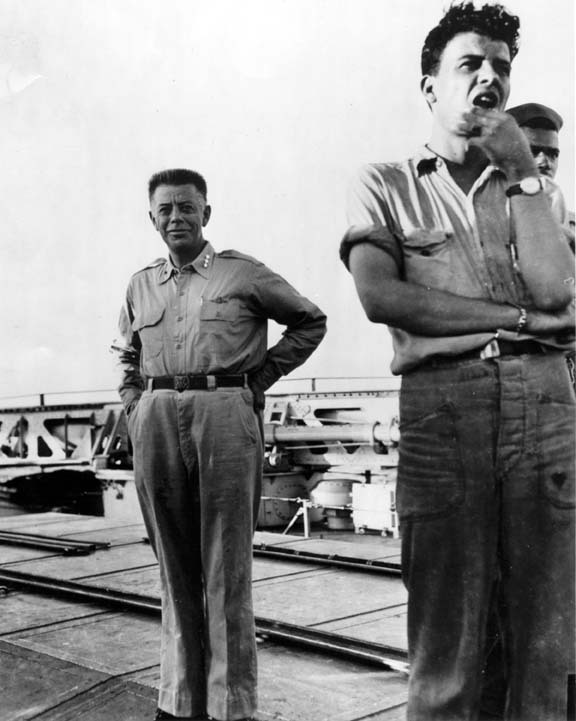 General George Kenney (left), aboard the USS Nashville in 1944. His willingness to try anything and everything led the 5th Air Force to be one of the most innovative and flexible USAAF units of WWII. Kenney and Benn decided to see if the B-17 could be used in low altitude anti-ship attacks. They’d read reports of the British using such techniques to bounce bombs across the surface of the water and into the sides of Italian ships in the Mediterranean Sea and thought that might be workable. Others in the 5th Air Force, including the legendary Paul “Pappy” Gunn, had concluded through experience that wavetop attacks were the only way to take out Japanese ships. Kenney sent Benn to command the 63rd Bomb Squadron, 43rd Bomb Group, which was used as an incubator for such tactics. 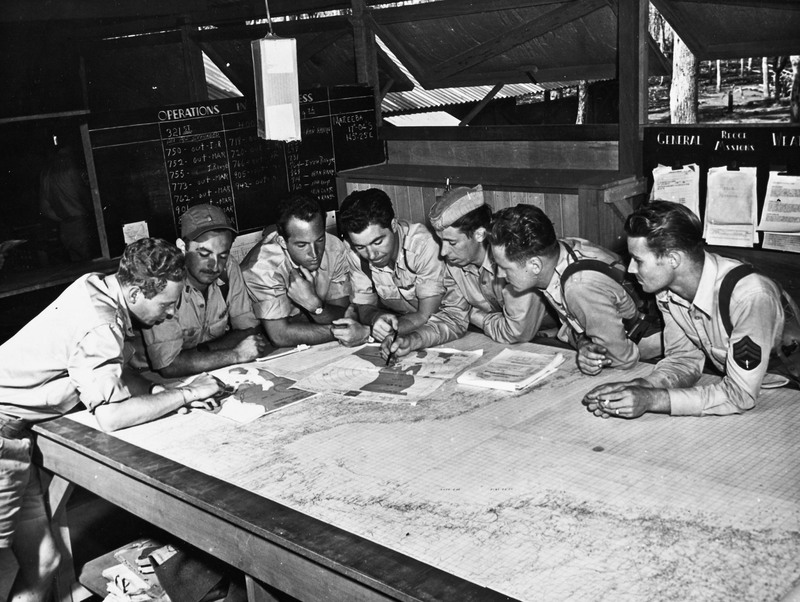 Simultaneously, the 3rd Attack Group also began working on the technique. Soon other units began training on the new tactics as well. That fall, the B-17’s of both the 43rd Bomb Group and the 19th began launching night skip bombing attacks against Japanese vessel. Operating in small numbers, or sometimes as lone wolves, the B-17’s prowled the night skies over the northern coast of New Guinea and New Britain in search of targets. They repeatedly struck heavily defended Simpson Harbor, Rabaul, which was the main Japanese base in the area. 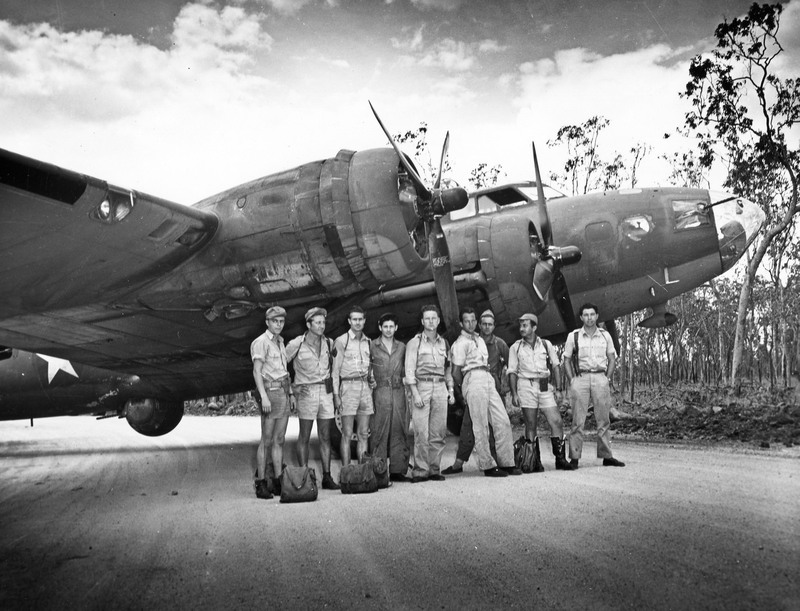 A 64th Bomb Squadron crew at Mareeba, November 17, 1942. Flying from bases in Northern Australia, the B-17 crews would stage out of Seven Mile Drome at Port Moresby, New Guinea, before heading out against their assigned targets or patrol areas. The attacks proved to be far more successful than all previous B-17 anti-shipping raids done from altitude. 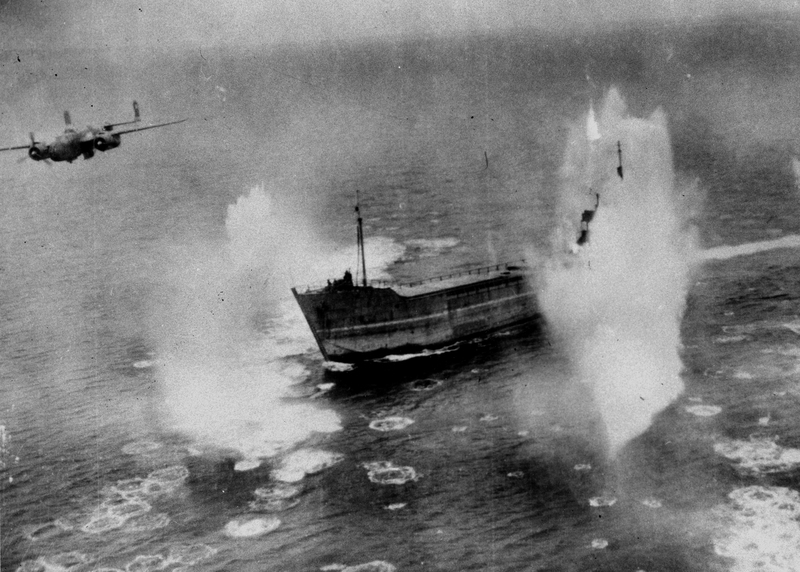 The 5th Air Force later estimated the hit rates against shipping increased from 1% to over 70%. Nevertheless, using Forts like this was a stopgap measure at best. Low and large, they were vulnerable to Japanese anti-aircraft fire, and they lacked the firepower needed to suppress those defenses during bomb runs. To counter that, the crews learned to make fast approaches from two thousand feet. 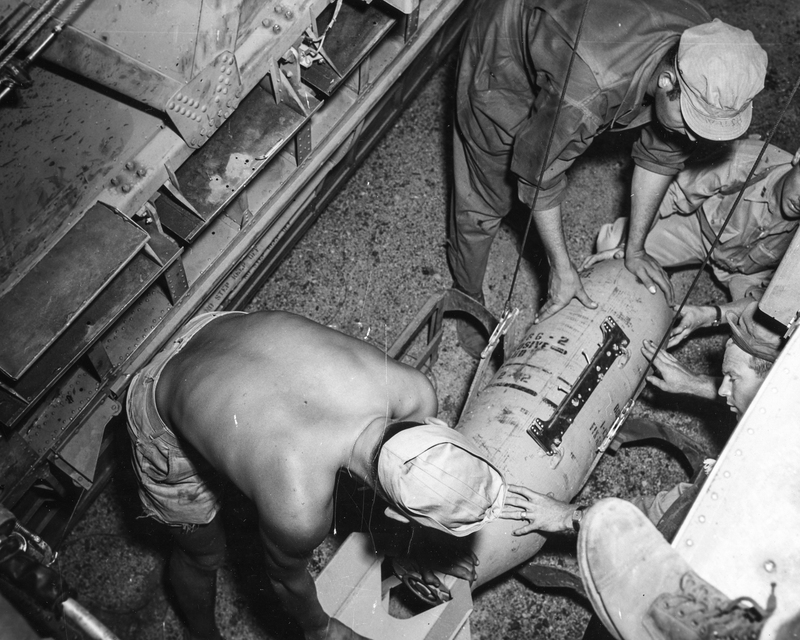 They would dive down, level off below five hundred, pickle their bombs and run for home on the deck. “The Old Man,” one of the 19th Bomb Group B-17’s. During a photo recon mission over Gasmata, New Britain in March of 1943, this Fort was intercepted by thirteen Japanese Zero fighters. The A6M’s made repeated runs on the bomber, wounding both pilots, the top turret gunner, the navigator and bombardier. The top turret gunner, who had washed out of flight school back in the states, ended up landing the B-17 with the help of one of the pilots back at Dobodura. When the forward hatch was opened, blood poured out onto the ground. Miraculously, everyone lived. The Old Man was repaired and later became General Whitehead’s personal aircraft. Eventually, the A-20 and B-25 gunships became the 5th Air Force’s primary anti-ship aircraft, along with Australian Beaufighters and Beauforts. 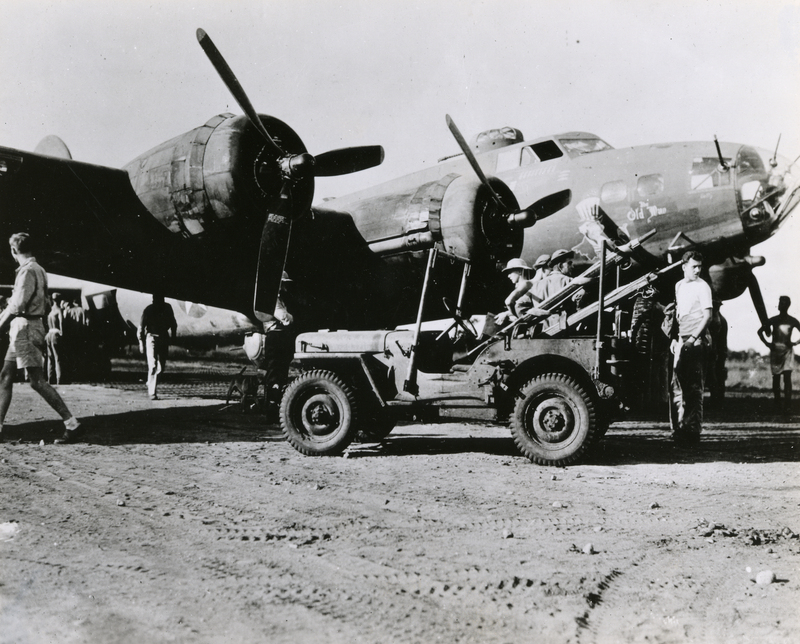 The B-17’s were replaced by longer-ranged B-24’s which were mainly used for conventional bombing from altitude. Still, for a brief period in late 1942-43, Kenney’s Fort crews carried out some of the most unusual B-17 attacks of the war. During the war, the USAAF, Marines and Navy tried to share their combat experiences and developments as much as possible. 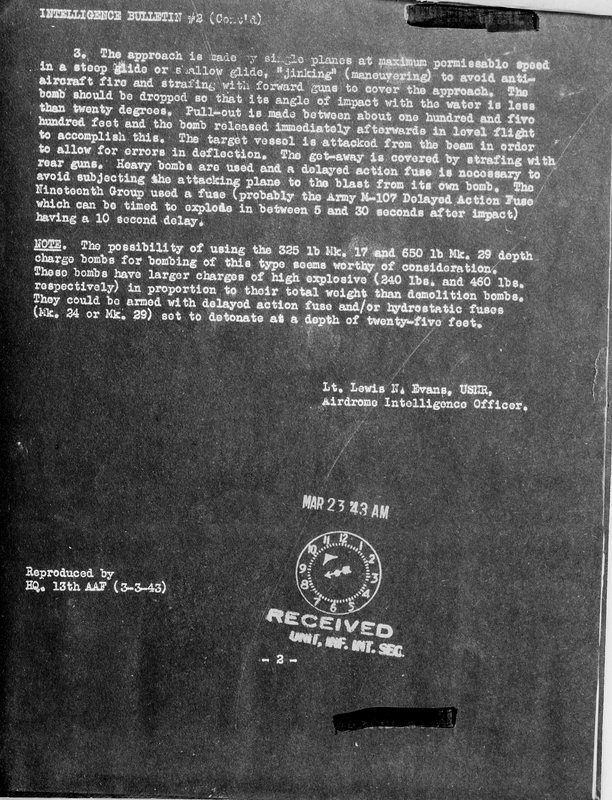 Part of this process included interviews with officers freshly returned to the States from combat. 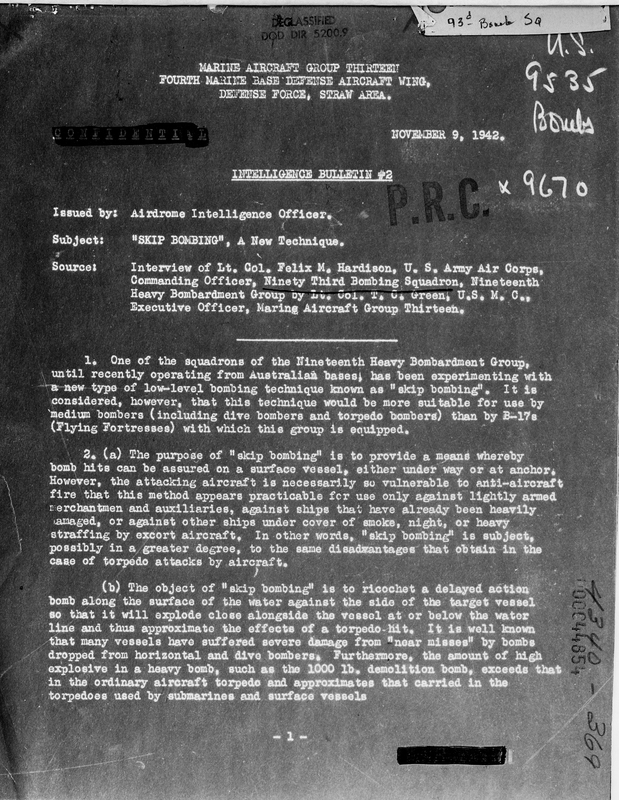 This document is an interview with one of the key leaders in the 19th Bomb Group conducted by a Marine Air Group Thirteen officer in late 1942. In it, Felix Hardison describes the tactics employed by the 19th Bomb Group, as well as the limitations of the B-17 in that role. Excellent detail for Kenny’s 5th! Don’t you mean Kenney’s 5th? Yes, after August 1942 and before he was promoted to FEAF commander (5th & 13th)! Thank you, GP. Best to you! And thanks for the reblog! Thanks to GP Cox for reblogging this very interesting post and leading us here! We like it very much! You try your best with what you’ve got , I guess. B-17s were never much good for anti-ship weapons , I think , skip-bombing or not . Must have been frustrating for those crews . Very much so. I’m writing a bit about the B-17 attacks in the Philippines and Dutch East Indies right now. The thing was, pre-war USAAF doctrine stressed the need for massed attacks from high altitude on shipping. The idea was to saturate the target area with bombs so that no matter how the enemy ship maneuvered, it would be hit. An interesting theory, but there were never enough B-17’s to prove the validity of that doctrine, so it became a moot point. Once skip bombing was developed and honed, there was no need to find out :). Have you run across any photographs of B-17s skip bombing? Y’all at International Historical Research rock!! Larry Hickey’s 345th Bomb Group history kept me sane in grad school at the U of O! And I just got your Tainan Air Group history!! Keep up the great work!! Thanks so much! We’re glad to hear you enjoyed Warpath Across the Pacific! I have not. I suppose that is probably because the majority of those attacks took place at night. Have you seen any? No, I haven’t. I’ve always wondered what such an attack might have been like, especially after having seen photographs of B-25s and A-20s barely clearing the masts of ships under attack by them. Interesting stuff. It’s amazing what a little innovation and imagination can accomplish (or destroy). Very true. Innovation in the face of extreme adversity is a great strength of our nation! Thank you for writing! Reminiscent of the ‘Dam Busters’ raids on the Ruhr Dams in ’43, when 617 squadron Lancasters wiped out three dams using special barrel-shaped bombs that were designed to skip along the water in just that fashion. The delivery height was 100 feet though, and the raids happened at night, so it must have been moderately hair-raising in a four-engined heavy bomber. Spot on. Bouncing bombs into ships and gigantic concrete dams in four-engined heavy bombers seems truly counter-intuitive to say the least. The innovation and reckless disregard for established doctrine and procedures says legions about the flexibility of both the 5th Air Force and RAF’s Bomber Command. Thanks for posting! PS: Fifteen years ago, I had the good fortune to interview a member of 617 Squadron. He wasn’t on the dam busting raids, but he did take part in the attack on the Tirpitz. Great guy. Was an honor to talk to him. Great subject! Thanks for posting about the technique. Great piece of historical military history, the pictures provide great illustration of the forces in play at the time.